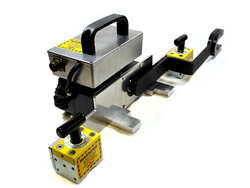 The CBS ArcSafe RSA-186 is designed for the Westinghouse Type ADM disconnect switch which allows technicians to remotely close or trip the Westinghouse load-break switch from a safe distance of up to 300 feet. CBS ArcSafe®, a leading manufacturer of remote racking and switching solutions for low- and medium-voltage switchgear, introduces its remote switch actuator (RSA) for the Westinghouse Type ADM disconnect switch. The lightweight, portable CBS ArcSafe RSA-186 allows technicians to remotely close or trip the Westinghouse load-break switch from a safe distance of up to 300 feet, well outside the arc-flash boundary. Installation and operation do not require any modifications to the existing electrical equipment, thanks to CBS ArcSafe’s magnetic latching system. The RSA-186 is compatible with Type ADM disconnect switches. Typical applications include use as a disconnect switch in AC-power systems up to 5500 V, with or without fuses. When compared to other arc-flash mitigation alternatives, the RSA-186 is a cost-effective solution for keeping operators safe. Optional features include radio remote with a range of up to 300 feet, 24 V DC LED light, wireless video camera system with LCD monitor, and rugged protective case assembly. All RSA units are portable, fast, and easy to set up; offer mechanical and/or electrical safety protection; are adjustable to fit unique electrical equipment configurations; reduce the requirements for personal protection equipment; and help customers with NFPA 70E arc-flash safety compliance. All CBS ArcSafe products are manufactured in the United States at our manufacturing facility in Denton, Texas. For more information, visit CBSArcSafe.com or call 877-4-SAFETY. CBS ArcSafe offers the electrical industry’s largest inventory of remote racking and switching solutions for low- and medium-voltage switchgear that do not require modification to existing equipment for operation and that allow technicians to operate equipment from a safe distance of up to 300 feet. All our equipment is manufactured in the United State at our Denton, Texas, manufacturing facility. CBS ArcSafe offers 24/7/365 emergency support and is happy to develop custom remote racking and switching solutions for customers. Learn more at CBSArcSafe.com or call toll-free at 877-4-SAFETY.